But now Mrs. Knickerbocker’s neighborhood was filling with marble and limestone palaces as the older brownstones were razed in favor of fashion. A decade earlier, in April 1887, California railroad tycoon Charles Crocker had purchased the Hutchinson mansion on 58th Street, next door to Cornelius Vanderbilt III’s block-engulfing chateau, for his newly-wed daughter Hattie and her husband Charles Beatty Alexander. Crocker was less optimistic about the prospects of his youngest son, George, who had a reputation of “being a reckless young man,” according to The New York Times years later. Charles Crocker’s will, therefore, stipulated that before George would not inherit a dime unless “for the space of five years continuously he shall abstain from the use of spirituous, vinous, or malt liquors, to the extent that he shall not during this period have been intoxicated.” George complied. In 1894, six years after his father’s death, he inherited $6 million of his father’s $30 million estate. The 1904 book Prominent and Progressive Americans would say of him, “His father’s wealth made it unnecessary for him to engage in any struggle for a livelihood.” Nevertheless, George assumed his role in the family railroad business. George Crocker had been an intimate friend of California mine owner Alexander Rutherford who died on March 16, 1893. 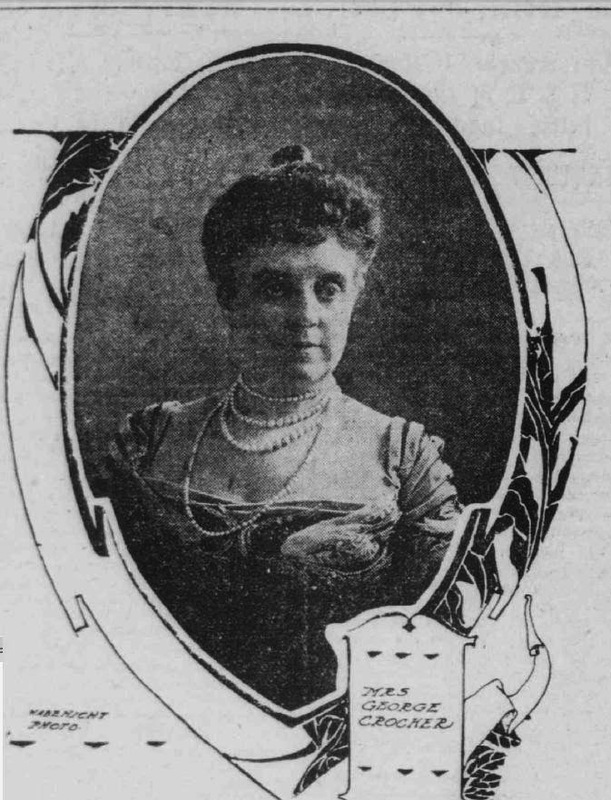 A year later, on June 5, 1894 he married Rutherford’s widow, Emma Hanchett Rutherford, in a fashionable Fifth Avenue ceremony in St. Thomas Church. The San Francisco Call said “She is a beautiful woman, who has entertained well and intensively at her residence on Bush street, but since her husband’s death she has resided in New York City.” Along with his bride came her three children, Alexander, Emma and Alice. Now, three years later, George, would set his sights on Helen Knickerbocker’s house. On September 29, 1897 The New York Times reported that Mrs. Knickerbocker had sold her “four-story brownstone-fronted dwelling” to George Crocker, “the California millionaire.” It was the end of the line for the staid old home. “It is said to be Mr. Crocker’s intention to demolish the present house and erect a residence for his own occupancy,” said the newspaper. 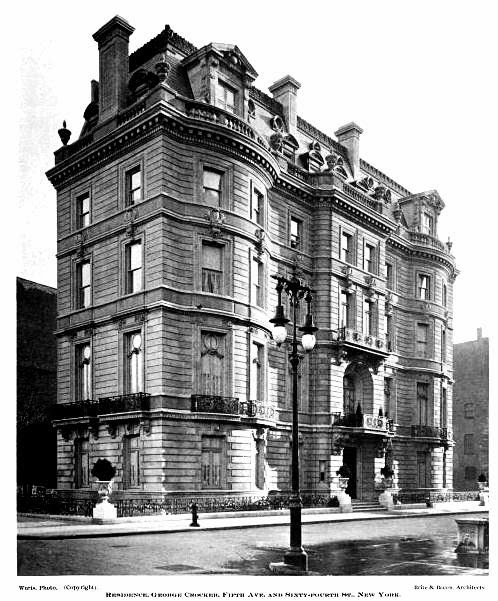 George Crocker gave to the architectural firm of Bright & Bacon the task of replacing the Henry Knickerbocker house with an up-to-date mansion . Plans were filed on January 27, 1898 and the San Francisco Call reported that “it will be five stories in height” and estimated the cost at $100,000—nearly $3 million today. The completed house at No. 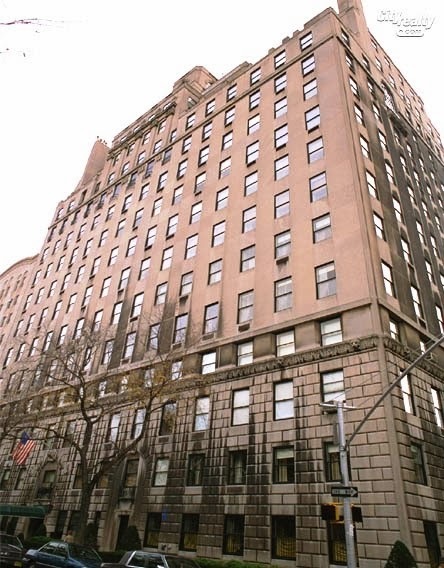 1 East 64th Street would reflect the couple’s wealth and social position. The Beaux-Arts mansion featured graceful French ironwork at the second story, a deep balcony accessed by French doors within a dramatic arch above the entrance, and an ornate mansard with oriels, dormers, stone urns and a decorative balustrade. As expected in the late 1890s, the mansion was designed with period rooms, filled with appropriate antiques, tapestries and artworks. Red velvet ropes led up the marble staircases “held in place by dolphin supports,” reported the newspaper. The ropes matched the red carpeting of the hall. 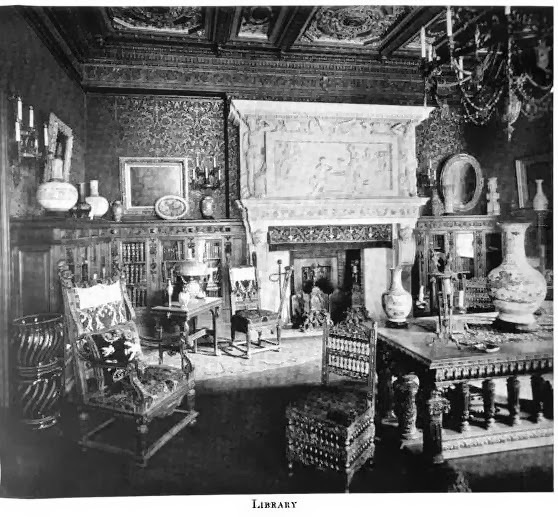 The first floor drawing room was furnished in Louis XV and Louix XVI antiques. 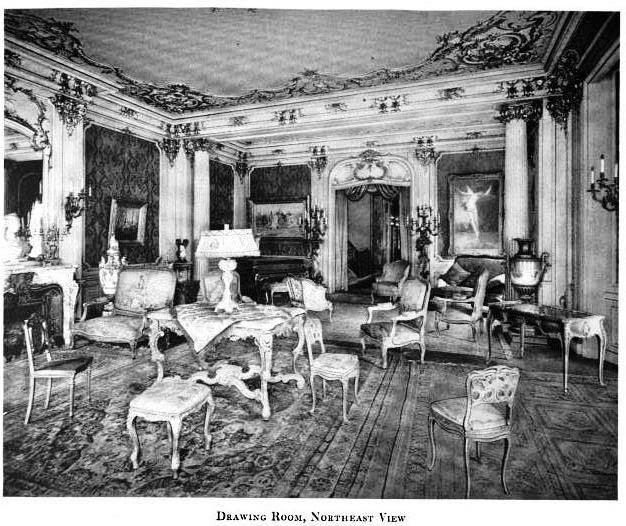 Below street level was the smoking room with heavy oak and walnut furniture upholstered in dark red. The fire had started in a gas radiator on the second floor. “It spread to the oiled floor, and a number of costly Turkish rugs and fine tapestry hangings were burned,” said the newspaper. A bucket brigade composed of servants helped extinguish the blaze; however the expensive furnishings were heavily water damaged. Entertainments for daughter Emma’s introduction into society were expectedly extravagant. On January 9, 1902 the Crockers gave a “very pretty dinner and dance,” according to the San Francisco Call. Emma Crocker decorated the house with potted orange trees and following dinner was a cotillion. The guest list that evening included the most prominent of Manhattan society. Among them were Mrs. Stuyvesant Fish, Mr. and Mrs. Oliver H. P. Belmont, Mrs. Herman Oelrichs, and Mr. and Mrs. Pembroke Jones. 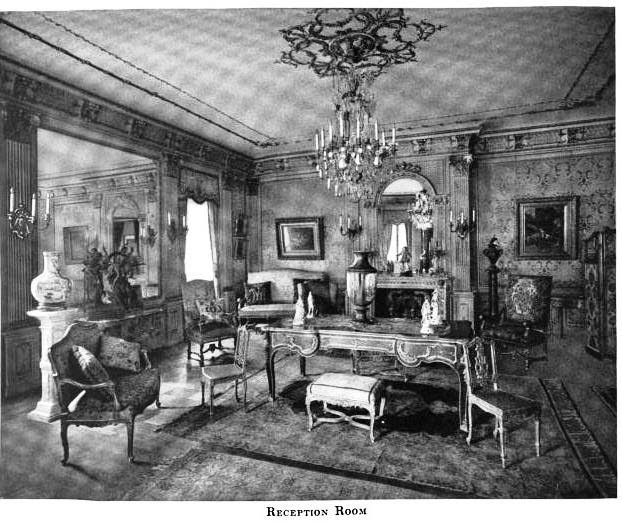 The Crockers summered at their Newport cottage, Shields Villa; built a mansion at Darlington, New Jersey deemed by the San Franciso Call to be “of palatial proportions;” and as was appropriate for the family of railroad tycoon, traveled about in their luxurious private railway car, the Emalita. In 1903, however, the glittering life of the Crocker family was about to change. Alice was engaged to J. J. Langdon Erving and excitement for a sumptuous social season was high. As the winter season began, Emma gave a musicale during which opera star Lillian Nordica sang. Unknown at the time, it would be the last entertainment Emma Crocker would give. She had been diagnosed with cancer. Despite her critical condition, Emma made the annual pilgrimage to Newport in July, traveling by boat “to avoid changes and to make the journey as easy as possible.” Constantly attended by nurses and physicians, her condition worsened until July 25 when she slipped into unconsciousness. Emma’s bedroom in the Newport cottage filled with family—George and the three children, J. J. Erving, and Emma’s sister and brother-in-law. On July 26, 1904 she died without regaining consciousness. Alice’s Newport wedding “which would have been the leading social event of the season,” according to The Times, was postponed “and all arrangements for the future movements of Mr. Erving and Miss Rutherford will be held in abeyance.” The newspaper also expected that Mrs. Herman Oelrichs would recall the invitations to all her social entertainments. In his grief, George struck out at the attending physician, Dr. Doyen, suing him for $20,000 “on the ground that ‘veritable moral violence’ had been used to convince him that she could be cured,” said the San Francisco Call. George Crocker immediately turned his philanthropic focus to the study, prevention and cure of cancer. He donated $50,000 to Columbia College “to encourage a study of the disease.” His near-obsession with his new-found cause would end in a bitter family battle a few years later. Ironically, within a few years of Emma’s death George was diagnosed with cancer. He underwent two operations. But the condition deteriorated and at 5:15 on the afternoon of December 4, 1909 the 54-year old multi-millionaire died in the Fifth Avenue mansion. Four days later The New York Times reported that Columbia College was to receive about $1.5 million to be known as the “George Crocker Special Research Fund.” The income from the fund would be used for cancer research. Crocker’s will instructed that the money for the fund come from the sale of the Fifth Avenue mansion. Trouble, however, was on the horizon. The mansion at No. 1 East 64th Street was in Emma’s name at the time of her death. Her will stipulated that it was to pass to George “for life, with the provision that it was to go to her children at his death.” George’s estate, therefore, would be legally unable to sell the property. Emma’s three children declared that up to the time of their mother’s death George had “exhibited loving and tender consideration toward them.” Little by little, however, George began conniving how to wrest the Fifth Avenue property from them. In December 1904 he promised to will each of them $300,000 in exchange for their interests in the property. On January 13, 1905 the transfer of title was made. When George Crocker’s will was read, the Rutherford children were shocked and wounded. Crocker had bequeathed $25,000 to his Chinese servant, Lee Hung Yung, and $100,000 to Mrs. Charles A. Childs (who “often visited him at his country seat,” according to The Times); to his brother and sister, Willliam and Hattie, he left $3 million each. The Rutherford children, Alexander, Emma and Alice were bequeathed $100 apiece of $12 million estate. There was no mention of the $300,000 due each for their shares of the mansion. When they lost their court battle, each refused the $100 willed to them. On January 4 through 6, 1912, everything in the house was sold at auction. Along with the costly antiques, artwork and furnishings, were the contents of Crocker’s wine cellar--valued at $11,593. 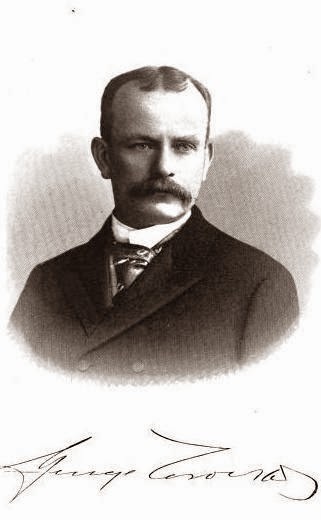 A month later, James B. Haggin was dead. He left an estate of just over $24 million. Margaret V. Haggin used $500,000 of that amount to pay off the mortgage on No. 1 East 64th Street still owed to Columbia. The mansion, along with the William Guggenheim house at No. 833 Fifth Avenue and the Frank Jay Gould mansion at No. 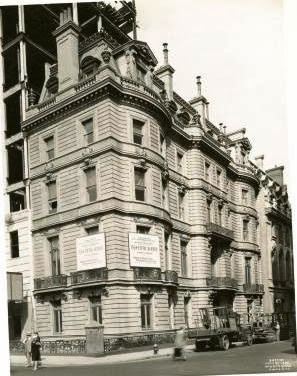 834 Fifth Avenue, would be demolished in 1930 to make way for the gargantuan apartment building designed by Rosario Candela. Candela’s 16-story building survives today. I believe that Mrs. Herman Oelrichs (pronounced, I am told, "Ulricks") was the daughter of Comstock Lode Millionaire, Jmaes G. Fair. her younger sister, Virginia, was the first wife of W.K. Vanderbilt, Jr. There is a deorating note here that you often see in similar houses of this vintage: A desk or large rectangular table placed in the center of a room, with two single chairs facing outward, placed at angles at the corners of the table, with other chairs scattered around. None of it seems arranged for easy conversation. the original design for 834 called for a midblock 120 foot wide structure with mostly full floor apartments, some half floors and a few duplexes on the first floor floors, and also on the setback floors.When she sold the apartment house was so advanced(they were bricking the first 2-3 floors,and all the steelwork was in place) that Candela couldn't do major changes,and since we are talking about 1930, with the Depression and all, he couldnt afford it either.So he added a new wing,or line , whoch consisted of stacked duplexes,each with 60 foot frontage.He also "took" one or two rooms from the backs of the adjoining larger units(ones with much bigger frontage) in the original design..
She then lived there for many many years. And yes part of the consideration was an apartment in the building, quite a common practice back then.Mansion/townhouse owners wanted to stay not only in the same neighbbourhood, they wanted to stay in the same place,(address) and the developers offered them all sorts of deals to convince them to sell their "outdated" houses. You have to remember back in the 20s individual townhouses and mansions were considered obsolete,inadequate,expensive to maintain...if it wasnt for the Depression we would have much fewer historic houses in NY..especially considering the crazy rate of construction in the 20s...in another 5-10 years they would have been all demolished..
Too bad she sold. Considering the slender lot left over after the Candela apartment was built, the structure would probably have survived the years as a small townhouse conversion or slipped into institutional use. Nice movement and undulation occurring on the stone facade. George Crocker was a stinker in life........and beyond!